Born in 1945, Locardia Ndandarika devolved a fondness for working with her hands, modeling clay as a child. She never lost that desire even after marrying Joseph Ndandarika in 1964. Over the course of their fourteen year marriage, she worked with her husband as he gained an international reputation as one of the world’s best stone carvers. Working in his shadow, Locardia tried to ignore her passion but failed. After repeatedly asking her husband to recognize her talents and contributions, and being turned down, she divorced him in 1978 and pursued her own career. This required a leap of faith most would not have been able to take. Leaving her husband and caring for her children on her own and embarking on a new career as a woman stone carver in a field dominated by men required a resolve few possess. Locardia is a skilled welder, having received awards for her work with metal. She is a mentor, tutoring many aspiring sculptors. Two of her children Ronnie Dongo and Virginia Ndandarika have become noted sculptors. Locardia was invited to New Zealand in 1990 as the sole woman among Zimbabwe’s greatest carvers and won international acclaim. 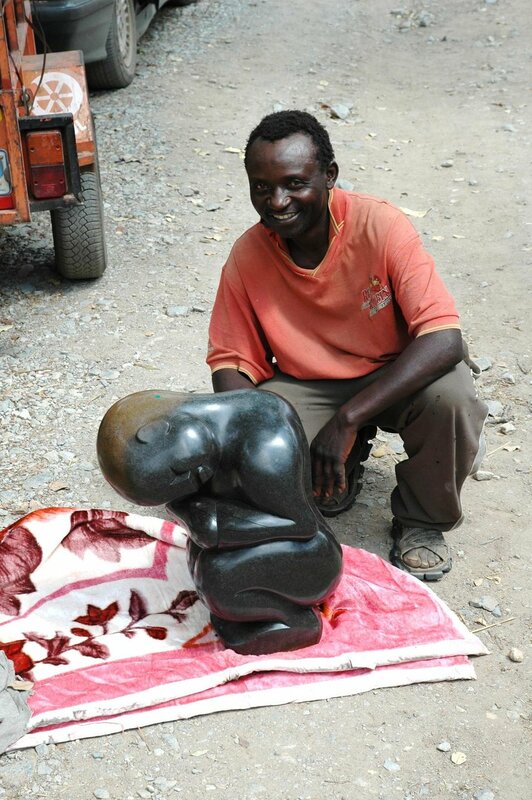 Considered the grandmother of all stone carvers, Mama Ndandarika has created enduring works that stir ones soul! Richard Mupumha was born in 1963 in Makoni, Zimbabwe. He began sculpting from stone as a child and began full-time sculpting in 1993. He is now regarded as one of the world’s leading third generation sculptors. He has and continues to tutor new and upcoming artists. His sculptures have been on display at the National Gallery in Harare, Zimbabwe. His talents are on display in galleries in the United States, South Africa and several European countries. Agnes Nyanhongo was born 1960 in Nyanga. Together with Colleen Madamombe, she is regarded as one of the most successful female Zimbabwean stone sculptor. Agnes is the daughter of first-generation sculptor Claud Nyanhongo and sister of Gedion Nyanhongo, and spent much time helping in her father's studio as a girl. She began sculpting full-time early in life, and in 1983 entered the B.A.T. Workshops in Harare, where she spent three years. Stylistically, her work is very similar to that of her father, and takes as its theme female issues of various sorts. Her sculptures are in the permanent collection of the Chapungu Sculpture Park in Harare, in Loveland, CO, and also at Museum of Outdoor Arts in Englewood, Colorado . Shy Lady.” He is a humble man and depicts humility is his work. Cosmos Chifamba was born into a family of eight siblings and began sculpting in 1991 as a school boy in Guruve as a means to supplement his school fees. He later left sculpting and worked in the industrial sector before returning to stone carving (he however, remained active in sculpting). Cosmos has been inspired by the work of Brighton Sango and Ephraim Chifumba. He returned to sculpting full-time in 2004 and wan artist in residence at the Sangarai Gallery in Guruve, Zimbabwe. He joined the Tenenenge sculpting community later in 2004 where he works today. His work has been exhibited in the United States, Germany, the Netherlands. together. He still sculpts at his home outside Harare in Chitungwiza, Zimbabwe. Human emotion and feeling is one of his most highly celebrated subject matters, this is easily recognizable in his work. Serpentine is his preferred stone of choice. He also sculpts in opal stone, both green and opal. Even amidst an environment that can be stifling and repressive, his reflections of joy and happiness clealy demonstrate his will. His works also demonstrates a connection with the spirit and animal world that shines throughout his remarkable sculptures. His style is very much his own, is truly innovative and he has been imitated by many younger sculptors, a high compliment. His works have been on display throughout Africa, Europe, The United States and Australia. Permanent displays include the National Gallery in Harare, Zimbabwe, Pretoria, South Africa, Frankfurt, Germany and the Netherlands. His sculptures and highly sought after by collectors worldwide. He is listed in the publication, Zimbabwe Stone Sculptors, The First Generation. Passed away 2011. Sylvester Mubayi was born in 1942 in the Chioata District, east of Harare, Zimbabwe. He also has a strong link to the Tengenenge community of first generation sculptors. He prefers to work in the hardest and most challenging stones, among them serpentine and springstone. Like Fanizani Akuda, he first worked in the Rhodesian tobacco industry. He has been sculpting since 1967 and won acclaim in South Africa after just two years! recognized in the publication, Zimbabwe Stone Sculptors, the FirstGeneration. Edward Chiwawa was born in 1935 in the Guruve district northwest of Harare. He is the cousin of Henry Munyaradzi, a first generation sculptor of international acclaim. He was introduced to stone carving when he visited Henry Munyaradzi at Tengenenge, the rural village credited as one of the most significant influences on Zimbabwean stone sculpting. He has been sculpting since 1970. He works with the shape of the stones he selects and his style is smooth, and often demonstrated in his smooth lines and signature round head sculptures. He lives in Chitungwiza, in close proximity to fellow master sculptor’s Fanizani Akuda and Sylvester Mubayi. His knowledge of and connection to his heritage is quite evident in his work. Serpentine, and opal stones are his preferred medium. He is married to Shelita, in her own right a sculptress of note. His talents have been displayed worldwide, including London, Paris, Rome, Budapest, Melbourne, Sydney, Ludwigshafen (Germany), New York, and California. His works are on permanent display in The United States, Europe and Africa. He is listed in the publication, Zimbabwe Stone Sculptors, The First Generation. Colleen Madamombe (1964-2009) was one of only a few female sculptors working in Zimbabwe. She was widely considered the best of them. Her work added a new dimension to Zimbabwean stone sculpture. She used her skills to highlight the unique qualities of Shona women and the inequities that affect their lives. Her powerful images and the contrast of rough and polished parts of the stone, make Colleen’s stone sculpture some of Zimbabwe’s most dynamic. Zimstone Gallery | Copyright © 2010. All rights reserved.